Every adventurer ends up at the Smithy's eventually. Whether they are customising their 'broken' knife-sword-flail-chain just one more time, making over-sized caltrops to slowdown their giant boyfriend, or replacing the shoulder-guards of their full plate with dragon skulls, adventurers need a big sooty man or woman with a heavy hammer and frighteningly large biceps. 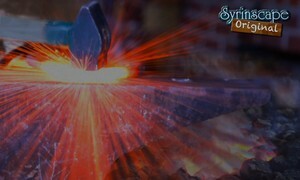 The "Blacksmith" SoundSet sets the scene beautifully for these encounters with every sound you'll need to bring this red hot venue to life... and just enough smoke to make your Players cough a little. "Fire intensified with bellows/Fuego avivado con fuelle" by "lebosqui"